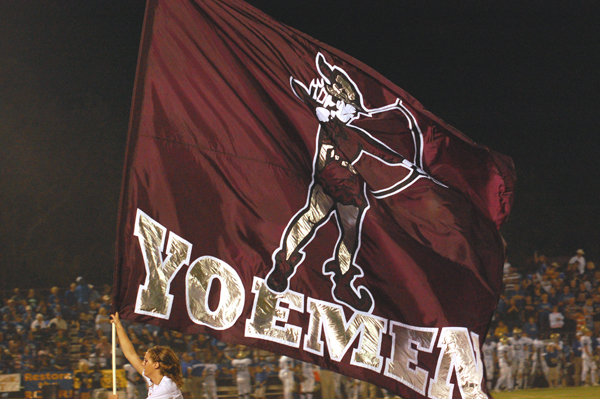 Cameron Yoe jumps to #1 in the Associated Press Class 2A Poll this week, Stephenville drops to #6 in Class 3A and Mart falls from to #5 in Class 1A. The latest Texas high school football Associated Press poll for September 9, 2013. Others receiving votes: 11, Arlington Bowie 18. 12, Southlake Carroll 14. 13, SA Northside O’Connor 10. 14, Pflugerville Hendrickson 8. 15, Austin Westlake 7. 16, Arlington Martin 6. 16, Spring Westfield 6. 18, Converse Judson 3. 19, Mansfield Timberview 2. 19, Smithson Valley 2. 21, Tyler Lee 1. 21, Denton Ryan 1. 21, Duncanville 1. Others receiving votes: 11, Mesquite Poteet 25. 12, Manor 21. 13, CC Calallen 15. 14, Wolfforth Frenship 12. 15, Amarillo 7. 15, Fort Bend Marshall 7. 17, Dallas South Oak Cliff 4. 18, Tyler 3. 18, WF Rider 3. 20, Ennis 2. 21, Edcouch-Elsa 1. 21, N. Richland Hills Birdville 1. Others receiving votes: 11, El Campo 22. 12, Shallowater 12. 13, Wimberley 10. 14, Gainesville 7. 15, Pittsburg 6. 15, Bellville 6. 17, West Orange-Stark 4. 17, Silsbee 4. 19, Fairfield 3. 20, Tyler Chapel Hill 2. 21, Somerset 1. 21, Dalhart 1. 21, Orange Grove 1. 21, Lorena 1. 21, La Grange 1. Others receiving votes: 11, Sonora 11. 11, Canadian 11. 13, Rogers 10. 14, Hughes Springs 8. 15, Grandview 4. 15, Taft 4. 15, Centerville 4. 18, Corrigan-Camden 3. 18, White Oak 3. 20, Deweyville 1. 20, Cooper 1. 20, Childress 1. 20, Idalou 1. Others receiving votes: 11, Pineland West Sabine 27. 12, Bosqueville 24. 13, Albany 16. 14, Muenster 13. 15, New Deal 7. 16, Shiner 3. 16, Windthorst 3. 16, Bremond 3. 19, Booker 1.